Alternatively, on top-right of the Ribbon bar. It serves to measure the distance between two points. We can use it when we want to know a distance without having to put a dimension. 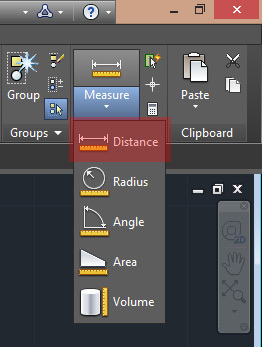 On the command, you have to click (with the snap on), up two points between which we want to measure the distance. We must be careful because in addition to the linear distance, there are also returned other values, Delta X, Delta Y, and so on. What interests us is the value in the “Distance”. It may not be visible, because as it returns different values, are occupied two or three lines of the command line, so since the distance is first value written, it happens that remains outside the command line. In this case, you just click the arrow, at right to command line, (Or press the “F2” key), to expand it and see the history of inserted commands, then find near the bottom of this window, the value “Distance”.